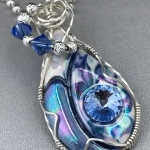 I create unique jewelry pieces using a combination of porcelain cabochons, druzy stones, gemstones, fused glass cabochons, wire wrapping and weaving and Kumihimo cord work. I started working with stained glass 25 years ago, became intrigued with fused glass and wire wrapping about 14 years ago when an instructor introduced me to both processes. Over time I have taught myself to manipulate the wire to create unique pendants, earrings, bracelets and rings. 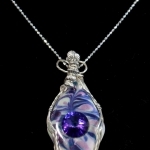 I love incorporating unusual stones (i.e. druzies) and cabochons (i.e. 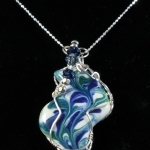 hand-painted porcelain and fused glass) into pendants and other items. The process of wire wrapping fascinates me. I love working with materials that fluctuate and never have quite the same result. 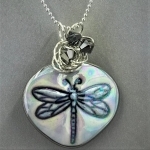 My main objective when creating my jewelry pieces is to combine different elements into one-of-a-kind wearable art. I have a Bachelor of Arts Degree from DeLourdes College (now a part of Loyola in Chicago) and a Legal Assistant Degree from Mallinckrodt College. I am retired and volunteer for the Closed-Captioning for the Hearing Impaired ministry at The Crossing in Chesterfield and at the Lillian Yahn Gallery (St. Charles County Arts Council). 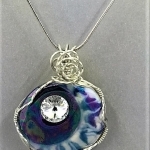 After wrapping my first cabochon, over the years I have learned different skills via Internet courses and tutorials. I continue to learn new skills and have recently taken a class on Kumihimo beading instructed by BOMH juried artist, Rosanne Sartori. I love the way the Kumihimo cords look with my wrapped porcelain pendants. 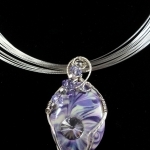 I will be attending the Bead & Button Show this June and taking several classes on various wire techniques. 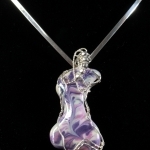 My jewelry has been in several shows at the St. Charles County Arts Council. One was the BOMH juried show in July 2015. The show was entitled “With These Missouri Hands.” I was the featured artist of the month in the St. Charles Arts Council gallery. My work was also a part of the “Brilliant Color” exhibit this spring at Framations Art Gallery in St. Charles, MO. I have been certified as a Self-Representing Artist in Jewelry Design by the international SRAJD and have been a member of that organization for over nine years. In addition to being a member of BOMH, I am a member of the Greater St. Louis Arts Association and the St. Charles County Arts Council. Broken & Renewed Glass Art can be found in these galleries: Framations Art Gallery (St. Charles, MO), MindScape Gallery (Chesterfield Mall), Arts and Experience Gallery (Greenville, IL) and the Lillian Yahn Gallery/St. Charles County Arts Council (O’Fallon, MO). My website is: brokenandrenewedglassart.com. My FaceBook page is: broken&renewedglassartbydonnaknox.